Well, I really did not think Bluum could get much worse after last month, but they just want to disappoint more and more . . . month after month. I know the price is low, at just $11 a month. I actually purchased through Eversave for $18 for 3 months. You KNOW if I do not think this box is an $8 value, something is seriously wrong. It gets worse. I actually had a $5 Eversave voucher, which brought it to $13 for 3 months. Worth $4 a month? Nope, not even that. I actually used a VISA gift card that I won to pay for it-- and I wish I had kept my gift card amount and my voucher, because this subscription box service is valued, I would say at $2- $3 a month. Here is what was in this month's box. 4 fl oz of Ecos Magnolia and Lily Laundry detergent. 50 ounces if $7.49-- so by even their estimates, this sample is worth 70 cents! Sometimes you have to laugh about these things. You can wash 4 loads with this sample. A 1 time use sample of aloe Baby's Tender Defender. There is so little, it is not even indicated on the packet, but the same size as those little samples that you get in the mail of diaper cream (like Desitin). 4 ounces is valued at $16. I would value this at nothing, seeing as I can get the same size sample at many different places-- for free. .25 oz StriVectin-EV Even Brightening Serum-- 1.7 ounces retails at $89.00. This is a SMALL bottle. I also am greatly concerned over the use of this product when pregnant or nursing. The ingredients are numerous and complicated. This product is not on the EWG web site, but I am not going to use it, as a few of the items in the ingredients list are rated as a 6 on the EWG web site. However, with something that costs $89, 1/8 of it would be $10?? It is not worth that at all, of course, because you can often get such samples for free from the makeup counter. 2-- 1 time use samples of Naturally its clean floor cleaner. This one HAS to be a joke of some sort. A 24 oz bottle is $5.99. This is a packet that you could get inside any flyer. It is pathetic as a sample and I value it at $0. SO, if you value everything in the box at THEIR values you MAYBE have a value of $13.10 or maybe $15.10 if these little time items are $1 each-- but that is STRETCHING it BIG TIME. I place the value of this box at maybe a couple of dollars at most . . . HOWEVER, the most significant problem with this box is that it is supposed to be for moms and babies-- oh wait, your baby does not like floor cleaner. Mine doesn't either. She also does not like laundry detergent. She is not incredibly thrilled with the one time use sample of the diaper rash cream. 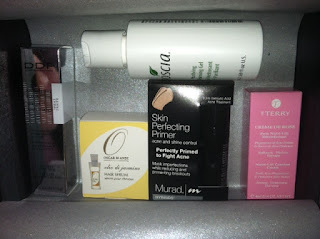 I should add it is hard for me to get excited about the face lotions even. They HAD to repeat the SAME company as last month??? The idea is to experience new companies, and in the 2 months I have received a box, a company was repeated. The samples included in this box are no where near "deluxe" and will not be anything that you or your child will get too excited about. Over 2 months, I would evaluate both boxes as a colossal waste of time and energy. The best thing about the box is it comes with tissue paper which I may actually use. As of 2016, Citrus Lane is officially closed. We highly recommend Bluum as an alternative to your Citrus Lane subscription. A full review of Bluum will be coming soon. I have to admit I was not thrilled with them at first. I was going back and forth with Customer Service about getting a tracking number, but I will give them this-- customer service actually responded every time within 24 hours-- not with a tracking number, but at least there was a response. I really thought I would cancel after the first month. I told them as much on their facebook wall :) My box would need to be AMAZING to keep my subscription. Needless to say, I am sticking with the membership an cannot wait for next month. So what was SOOOO amazing . 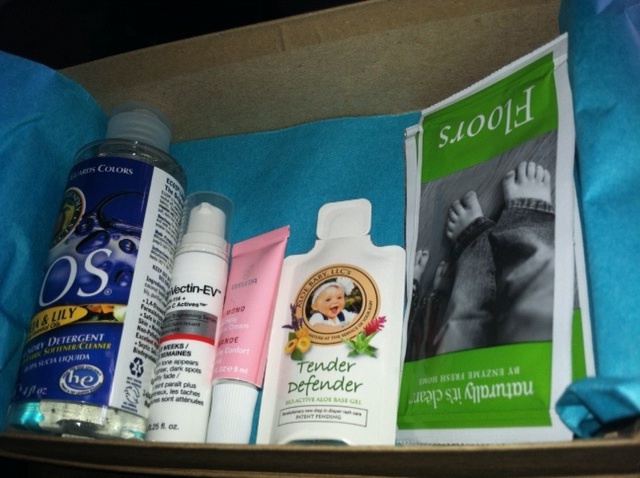 . . well, first let me explain that this is an expensive box-- it is $25 a month, but if you sign up through this link and use code JULYBOX to get your first box for only $7!!!!!!!!!! Wanting to buy a long subscription? I also should explain what makes Citrus Lane a little different. YOUR box is based on YOUR child. You indicate your child's age and gender and they send an appropriate box. I believe the age goes up to 3 or 4, and I got a box that was clearly for a toddler (my almost 2 year old). On to the contents. Not everything is in the photo, and I will explain. Paul Frank board book. It is SUPER cute and daughter LOVES it. Value $6.99 is their estimate-- on Amazon for a sale price of $9.99!!!!! Sample of Juice Beauty Antioxidant Serum (.17 oz)-- They do not give a value-- 2 oz is $45.00 on amazon--- Citrus Lane includes a mom surprise apparently every month as a little bonus. So add all this up- $28.47 is their value--- JUST for the stuff above (I am NOT done), $35.08 with amazon prices. So in JUST the items (which they perhaps UNDERvalued) you got your money's worth. BUT WITH THIS BOX came a $15 ecomom gift card. NOT some coupon of $15 off 40. No a GIFT CARD with no restrictions of anything like that!!!! That brings the value to $43.47 or $50.08. As an ecomom shopper, I am already using my code this evening! Gift card and sample not shown, as the gift card was a # I do not want to share :), and the sample was snatched. That is my little one's hand grabbing for the soap already! Needless to say, I am blown away. 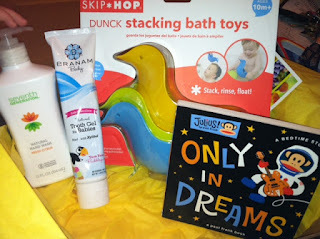 This is not a sample box like other places that send small samples, but a company that sends full sized products that are AGE appropriate for your CHILD. I just simply love them!!!!! And I CANNOT WAIT for next month!!! !